Reaction: Many on Capitol Hill give thumbs-up. Plus, check out a full meal of sound bites. Transcript: Missed the speech? Read it here. Loan Terms: A sweetheart deal? Evaluate the details yourself. Special Report: Check out the background, the complaints, a timeline and the players involved with Gingrich's ethics case. Voter's Voice: What do you think of the Dole loan? Bulletin Boards: Join the debate on Gingrich's decision. In Other News: Reno defends her independent counsel decision; White House hosts child development conference. In a floor speech to House colleagues, Gingrich said he and his wife considered several options, including using campaign funds or creating a legal defense fund, before deciding to pay the money with personal funds. On the way into the House chambers, Gingrich called Dole "a great patriot" and "a very close personal friend." "It's [the loan] a wonderful step on his part and at the same time he's going to get a good commercial interest rate and he'll make money," Gingrich said. Asked if it closes the ethics issue, Gingrich said, "I'll let you decide that." As he had earlier, Gingrich continued to accept responsibility for lengthening the ethics probe. In that case, Gingrich admitted that he should have sought legal advice on the propriety of using tax-deductible donations to fund two college courses that he taught. He also admitted to providing inaccurate information to the ethics committee in two instances. But Gingrich also put the blame on a law firm that he said had provided inaccurate information to the committee. 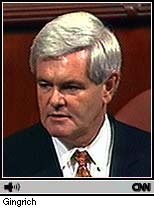 Gingrich portrayed the $300,000 penalty as an assessment for the added costs of the probe, not a fine for misbehavior. "There was no finding by the committee that I purposely tried to deceive anyone," Gingrich said. The speaker said he considered suing the law firm and using the proceeds from a settlement, but decided that "could take years in court." Gingrich thanked his wife Marianne for helping him work through the issues; she reportedly had been vehemently opposed to tapping the couple's personal funds. Under the loan agreement, Gingrich is committed to personally pay the money back within eight years. Sources say Dole came forward on his own to offer the money "a couple of weeks ago" as a gesture of confidence in Gingrich and a signal to the GOP about the importance of Gingrich's continued leadership. According to sources, the $300,000 will be in the form of a loan to be repaid at "prime plus one-and-a-half." At current interest rates, that makes it a 10 percent loan. Gingrich will pledge that only he, not political supporters, will repay the money. 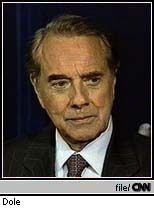 Sources say the plan was finalized Wednesday, but that at one point Dole suggested that he, George Bush and Gerald Ford loan the money jointly. After discussions, however, Dole decided that he would loan the money on his own. According to one close Gingrich confidante: "This is a huge statement to the Republican party ... that Dole thinks this is important enough to do on his own." Dole explained the loan in a statement. "I am pleased that our highest ranking elected official has chosen to set an example of accountability and ethics for the nation through his words and actions. For that reason and many more Newt is a friend and I am pleased that I can be of assistance," Dole said. "I consider this not only an opportunity to support a friend but a long term investment in the future of our party." Sources told CNN's Frank Sesno that former Housing and Urban Development secretary Jack Kemp helped persuade a reluctant Gingrich that he would have no trouble, after he leaves government, earning money through speeches and repaying the loan. The arrangement also puts a final end to some friction between Gingrich, the idealogue, and Dole, the pragmatist, when they served together in Congress. Republicans in Congress praised the speaker for moving decisively to put the issue behind him; many warned Gingrich that paying the penalty with campaign funds could provoke a nasty backlash. But some Democrats blasted the Dole loan. Rep. George Miller (D-Calif.) noted that Dole has recently been hired by tobacco firms to work on a settlement of tobacco litigation. Earlier this month, Dole joined the Washington, D.C.-based law firm, Verner Liipfert, as "special counsel." It is one of the law firms with tobacco company clients, and its staff include such Democrats as former Texas Gov. Ann Richards and former Senate Majority Leader George Mitchell of Maine. "We now have the chief lobbyist for big tobacco financing the payoff of the speaker's fine for lying to Congress," said Miller, a longtime Gingrich nemesis.